Tofu or soya Paneer is a great source of protein. Tofu Peas or soya matar Paneer is a great side dish to have with roti. You can make Tofu Pea Curry or soya Paneer matar in the same method like we make Matar Paneer Curry. But you can make Paneer without frying it along with peas. 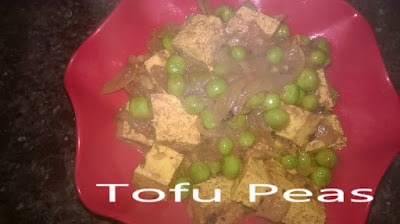 Tofu's (Soy Paneer's) taste enhances only after frying it and then it becomes suitable to make any curry recipe from it. I make always dry Soya Paneer Matar or Tofu peas. Cooking Time : 15 to 20 mins.